Earlier today, I made myself a to-do list to combat my lazy afternoon attitude and tackle the amount of tasks that lay before me. I was trying to think of a good way to keep track of my progress so that I could easily blog about it, and found that Google Tasks (it's in Gmail, if you're not familiar) was just the thing to do. My list is sorted by due date, so I can keep track of doing things as I go along. Things not on the list that I should be doing every day are things like dishes and straightening up around the house. Sometimes I actually do need to put those things on a list to get them done, but I'm hoping I can just get it done. Like a big girl. Progress! I'll keep updating as I go...more for myself than for anything else - I'm sure this is not really interesting to anyone else; but if I publish it, then I'm somehow holding myself more accountable or something. 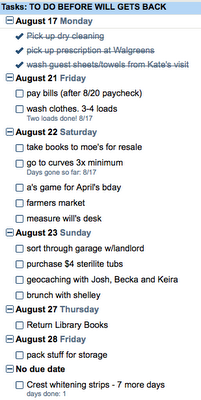 I didn't know you could make a To Do list on gmail! I'm totally going to use that now!